You'll soon be able to bring your favourite cattle dog to life off-screen in the form of a beautiful range of books. BBC Studios and Penguin Random House Australia have just announced they will be releasing two storybooks and one activity book from the hugely popular cartoon series in Australian stores before Christmas 2019. "We've been overwhelmed with requests for books and toys since the show began and we are incredibly excited that kids and parents will soon be able to read, as well as watch, more wonderful Bluey stories," said Charlie Aspinwall, Executive Producer for Ludo Studio. The exciting news comes after the producers have revealed the show is set to go global by the end of the year - and the Aussie accents will remain intact. 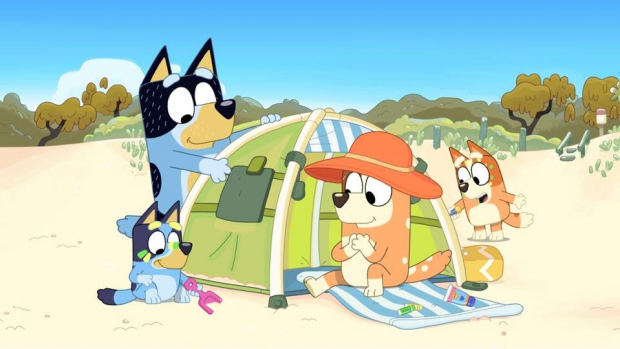 For the uninitiated, Bluey follows the adventures of a family of blue heelers - Bluey, Bingo, Bandit and Chili - and is set in suburban Brisbane. It's a very honest, relatable and hilarious portrayal of family life. "I think the show is about the joy of childhood and it reminds parents of why they had kids in the first place," said Aspinwall in an an interview for 7.30 Report. Launched only last October, Bluey has already been a phenomenal success, with a legion of dedicated fans falling head over heels for the delightful family of dogs. Parents love it as much as their preschoolers. It's already been downloaded more than 23 million times - the highest figure ever for any ABC TV show. "To work with such exceptional home-grown content is an honour and we can't wait to channel the humour, emotion and refreshing family dynamics of the show into a diverse and exciting range of books," said Holly Toohey, Head of Brands, Partnerships and Audio Penguin Random House. Bring on the books, thanks Santa! Christmas is sorted.